READ: “Back Channel to Cuba” Exposes the Hidden History of Washington-Havana Negotiations | Democracy Now! 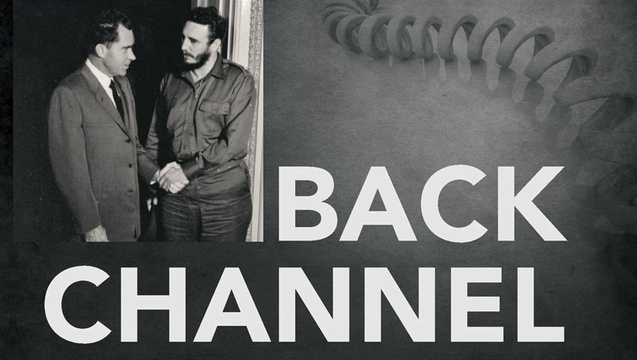 On Thursday we interviewed Peter Kornbluh of the Cuba Documentation Project at the National Security Archive, and William LeoGrande, professor of government at American University, about their new book, Back Channel to Cuba: The Hidden History of Negotiations between Washington and Havana. Read the introduction to the book below. See all of our Cuba coverage. Our relations are like a bridge in war-time. I’m not going to talk about who blew it up—I think it was you who blew it up. The war has ended and now we are reconstructing the bridge, brick by brick, 90 miles from Key West to Varadero beach. It is not a bridge that can be reconstructed easily, as fast as it was de- stroyed. It takes a long time. If both parties reconstruct their part of the bridge, we can shake hands without winners or losers. Sent to Cuba in the fall of 1962 by President John F. Kennedy and his brother Robert to undertake the first real negotiations with Cuba’s revolu- tionary regime, Donovan had secured the freedom of more than one thou- sand members of the CIA-led exile brigade that Castro’s forces had defeated at the Bay of Pigs. In addition to the prisoners, Donovan also secured Cas- tro’s confidence. Through trips in January, March, and April 1963, he built on that confidence to negotiate the freedom of several dozen U.S. citizens detained after the revolution. In the respectful nature of their talks, Castro found the first trusted U.S. representative with whom he could seriously dis- cuss how Havana and Washington might move toward restoring civility and normalcy in the dark wake of the Bay of Pigs and the Cuban missile crisis. “In view of the past history on both sides here, the problem of how to inaugurate any relations was a very difficult one,” Castro observed. The CIA’s infamous assassination plots—exploding conch shells, poison pens, poison pills, sniper rifles, toxic cigars—are the stuff of legend in the his- tory of U.S. policy toward the Cuban revolution. Washington’s efforts to roll back the revolution, through exile paramilitary attacks, covert action, overt economic embargo, and contemporary “democracy promotion” programs, have dominated and defined more than a half century of U.S.-Cuban rela- tions. What Henry Kissinger characterized as the “perpetual antagonism” between Washington and Havana remains among the most entrenched and enduring conflicts in the history of U.S. foreign policy. There is, however, another side to the history of U.S.-Cuban relations, far less known but more relevant today: the bilateral efforts at dialogue, rap- prochement, and reconciliation. Every president since Eisenhower has en- gaged in some form of dialogue with Castro and his representatives. Some talks have been tightly circumscribed, dealing only with specific, narrow is- sues of mutual interest, such as immigration, air piracy, and drug interdic- tion. Others have been wide-ranging, engaging the full panoply of issues at stake between the two sides. Some episodes of dialogue produced tangible agreements, formal and informal; others sputtered to a halt with no dis- cernible result. But every U.S. president, Democrat and Republican alike, has seen some advantage in talking to Cuba. Given the domestic political sensitivity surrounding any hint of better re- lations with Havana, these talks, and many other contacts with Cuba, have often been conducted through secret, back-channel diplomacy. To maintain plausible deniability, U.S. presidents have turned to third countries, among them Mexico, Spain, Britain, and Brazil, as hosts and facilitators. To limit the political risk of direct contact, Washington and Havana have developed creative clandestine methods of communication—deploying famous literary figures, journalists, politicians, businessmen, and even a former president of the United States as interlocutors. When face-to-face talks have been neces- sary, Cuban and U.S. officials have met furtively, in foreign cities such as Paris, Cuernavaca, and Toronto, or in private homes, crowded cafeterias, promi- nent hotels, and even on the steps of the Lincoln Memorial in Washington, D.C. On several occasions, White House and State Department officials have secretly traveled to Havana to negotiate face-to-face with Fidel Castro. Not surprisingly, this rich history of U.S. back-channel diplomacy with Cuba has been shrouded in secrecy, buried in thousands of classified files that record the internal debates, meetings, agendas, negotiations, argu- ments, and agreements that have transpired over more than half a century. In the absence of an accessible historical record, scholarship and analysis on U.S.-Cuban relations has largely focused on the more prominent and visible history of antagonism, skewing the historical debate over whether better ties were possible—or even desirable. The dearth of evidence on the many efforts to find common ground has empowered the “anti-dialogueros,” as one U.S. official called them, to cast serious diplomacy with Cuba as an oxymoron at best, a heresy at worst. Long after the end of the Cold War, talking with Cuba remained a delicate and controversial political proposition—even as the benefits have become increasingly obvious to both countries. This book presents a comprehensive chronicle of the history of dialogue between the United States and Cuba since 1959. The pages that follow are an attempt to assess this historical record of negotiations—both secret and open—at a time when that record is especially pertinent to the political discourse over U.S. relations with Cuba. Both Barack Obama and Raúl Cas- tro publicly declared their desire to move beyond the past half-century’s legacy of hostility. Both Washington and Havana appeared to realize that international, national, and mutual interests would be advanced by a suc- cessful negotiation of normal bilateral ties. But as the history of dialogue shows, having the intention to improve relations and actually accomplishing it are two different things. Between intention and realization lies a long road of negotiation on complex problems. But the past holds lessons for contemporary policy makers on how to navigate that road. 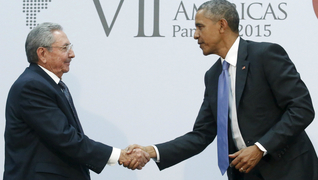 How have previous talks evolved between Washington and Havana? Why have some succeeded and others failed? What does this history tell policy makers, scholars, and concerned citizens about the po- tential for rapprochement between two nations that have been “intimate enemies” for more than half a century?6 These are among the key questions explored in this volume. To reconstruct this history, we have spent more than a decade unearth- ing the classified files—through the Freedom of Information Act, manda- tory declassification review, and archival research—on multiple episodes of dialogue between Washington and Havana. These include the State Depart- ment’s file, “Efforts at Negotiation with Cuba,” from the Eisenhower admin- istration; “Contacts with Cuban Leaders” records compiled during the Ken- nedy and Johnson administrations; the “Special Activities” file kept by Henry Kissinger’s office on his top secret attempt to negotiate normal relations; the Carter administration’s road map to normalization and memoranda of conversations with Fidel Castro himself; and internal papers from the Clin- ton White House on engagement with Havana. These records, along with hundreds of others, shed new light on the policies, strategies, and interplay of both governments in their pursuit of better relations. With the documents in hand, we interviewed a broad array of the sur- viving policy makers and negotiators who drafted the documents and par- ticipated in talks—Fidel Castro and former president Jimmy Carter among them—along with the intermediaries who carried messages back and forth between Washington and Havana. Their firsthand accounts bring the docu- mentary record to life, adding a critical human dimension to the story. In- deed, in many ways, this book chronicles the tenacious efforts of key official and nonofficial policy actors who, for more than fifty years, challenged the national security managers in successive administrations to consider the options of dialogue and engagement over the dominant U.S. approach of antagonism and estrangement. The perennial conflict between U.S. officials who advocated punishing Cuba to force its compliance and those who argued for diplomacy is a re- current theme of this history. Every administration has had its “hawks” and “doves” on Cuba. How they interacted depended, to some degree, on the domestic and international circumstances of the time. At every juncture, efforts at dialogue—and their success or failure—were a product not only of the state of relations between Washington and Havana but also of the bal- ance of domestic political forces in the two capitals. To the extent possible given space limitations, this book provides and analyzes the political circum- stances and context within which bilateral talks took place. Although Fidel Castro’s preeminence and dominance meant that policy making in Havana was less fractious than it was in Washington, the pages that follow reveal that there were debates on the Cuban side as well. Cuban policy was hardly static; Fidel’s attitude toward the United States evolved over time. Raúl Castro’s succession introduced yet another factor—his deter- mination to resolve the revolution’s critical outstanding problems, among them relations with the United States, before passing the baton to the next generation of Cuban leaders. 3. Castro and Ramonet, Fidel Castro: My Life, 262. 4. Bigger, Negotiator, 154, 155. 6. The characterization is from Pérez-Stable, Cuba and the United States: Intimate Enemies. 27, 1975, NSA Cuba Collection. 8. “Raul Castro Says U.S. Team’s Visit Is Step Forward,” NYT, April 9, 1977.